A video of a group of cyclists accusing auxiliary police officers of bullying them by "forcing" them off the road has received flak from netizens. 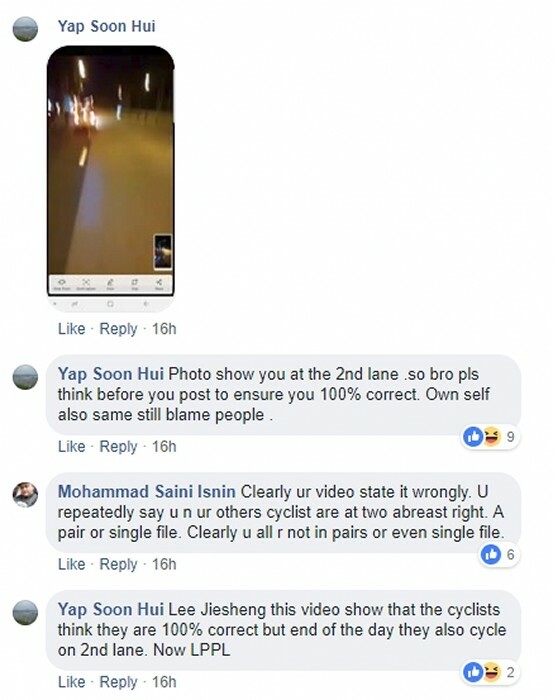 The video of the cyclists confronting the Certis CISCO driver and another officer was posted on ROADS.sg's Facebook post and contributed by Joseph Lee. According to the post, the incident happened along Yishun Avenue 1 towards Yishun Dam on Oct 31 at about 10.30pm. Joseph accused the officers of being "clueless about the law" and "driving recklessly, endangering the life of cyclists." In the video, the cyclists are seen berating the officers from outside the vehicle. After waving at the driver to stop, the cyclists are heard telling him, "don't move". "We are legally on the road," one of them says. "We are riding safely two abreast. "Why are you all forcing us off the road?" They then ask for the officers to "show them the law" that says they cannot ride "two abreast". They continue to go on at the officers, insisting what they are doing is "legal". When the person recording the exchange gets around to the passenger side window of the police car, the officer is explaining that they were just informing the cyclists to ride to one side in single file for their own safety, considering the heavy traffic on the road. "Where is the heavy traffic?" one of the cyclists demands. After a while, the driver of the car apologises but the riders are not satisfied with the apology. One of them accuses him of saying sorry "for the sake of it". The exchange comes to an end after they get the officer to give them the name of his supervisor. Some netizens sided with the cyclists and said that the police car driver should have overtaken the cyclist from another lane and kept a "safe distance". However, the vast majority of commenters felt the officers had good intentions and slammed the cyclists for being rude. Another video later emerged showing how the cyclists were riding before the confrontation took place. 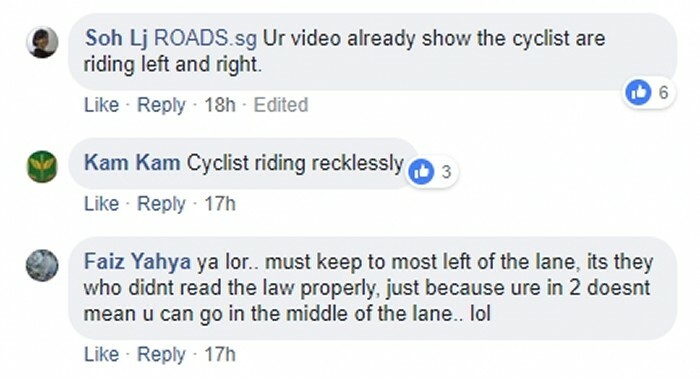 It was posted in the comments of the video and also uploaded on YouTube by SG Road Vigilante. In the video, the group are seen taking up the left lane and the cyclist recording the video is clearly seen moving into the second lane as well. Netizens were quick to point out that the cyclists themselves were riding recklessly and not entirely blameless. Stomp understands that the driver had good intentions and wanted to guide the cyclists to cycle in one lane. There was no malice involved.